As any kid with an erector set can tell you, the more interchangeable parts you have, the more neat stuff you can build. And the same holds true for influenza reassortment - the more gene segments available for swapping - the more novel subtypes that are likely to emerge. And in recent years the number and diversity of circulating avian flu strains has literally exploded around the globe - but most particularly in China - providing a wealth of genetic parts from which to erect new viruses. Since 2013 we've seen the emergence and spread of H5N8, H5N2, H5N6, H7N9, H10N8 and a longer list of `minor' players and offshoots, all of which co-circulate and intermingle with dozens of other (generally LPAI) viruses, creating a very diverse and target rich environment. Reassortment occurs when two different flu viruses simultaneously infect the same host, and one virus swaps out chunks of their genetic code with gene segments from the other, creating a hybrid of the two. This can (very rarely) produce abrupt, dramatic, and sometimes even pandemic inducing changes to the virus (see NIAID Video: How Influenza Pandemics Occur). Today we've a study recently published in Nature's Scientific Reports, that examines avian influenza viruses (AIVs) circulating in ducks, geese and wild birds in China's Hunan Province, and finds not only previously identified H3N2, H3N8, and H5N6 viruses, but most importantly, a new reassortant avian H3N6 virus. And being an H3 virus, and already showing some ability to infect mammalian cells, makes this reassortant virus of particular interest. While we worry about the evolution and mammalian adaptation of avian H5 and H7 viruses, over the past 130 years we've only seen human influenza epidemics caused by H1, H2, and H3 viruses, leading some scientists to wonder: Are Influenza Pandemic Viruses Members Of An Exclusive Club? Although unproven, it does tend to make us look more closely whenever we see a novel H1, H2, or H3 virus in the wild. Below you'll find the link, abstract, and a few excerpts from a much longer open access research article. Follow the link to read it in its entirety. 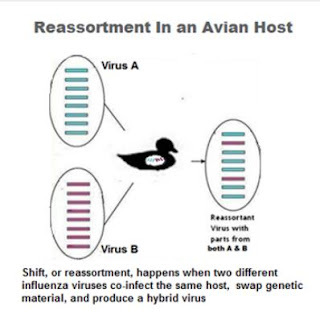 Multiple infections of avian influenza viruses (AIVs) in poultry or wild birds contribute to the continued evolution of H5 subtype viruses in nature and provide potential recombination of AIVs of different origins. In this study, we carried out surveillance of AIVs in ducks, geese and the environment of a community in Hunan province, China, from 2014–2015. We isolated multiple co-circulated AIVs including H3N2, H3N8, and H5N6, and, most importantly, a novel reassortant: H3N6. Phylogenetic analyses suggest that H3N6 is highly likely derived from H5N6, which has recently been shown to have zoonotic potential with human infections. Studies with mammalian cell lines and a mouse model indicate that four selected AIVs of duck or goose origin can infect MDCK and A549 cells but have low pathogenicity in mice. We propose that a potential co-circulation of multiple subtypes including H5N6 in local area may result in the production of novel subtypes such as H3N6 by gene reassortment. Waterfowl are chief natural hosts of H3N2, H3N6, H3N8, and H5N6 viruses. In the literature, we confirmed that most H3N2, H3N8, and H5N6 viruses reported from 2012 to 2014 were isolated from waterfowl, especially mallard and Muscovy ducks, and few were isolated from chickens. These results suggested that waterfowl, but not domestic chickens, contributed to the evolution of H3N2, H3N8, and H5N6 viruses. Human infections with H5N6 virus in China underscore a potential public health risk of the virus. In our study, the two H5N6 isolates had low mammalian pathogenicity, despite efficient replication in mammalian cells. Similarly, the novel H3N6 reassortant also had low virulence in mice. Thus, H3N6 and H5N6 AIVs have not yet fully adapted and may cause severe diseases in mammals if allowed to evolve further. In summary, our study demonstrates that domestic duck and goose farms in southern China provide an ecosystem for co-circulation of multiple AIVs and facilitate the generation of novel reassortants such as H3N6 that could potentially infect mammals. Thus, large-scale surveillance of related AIVs in waterfowl in farms and mammals in surrounding areas are urgently needed in southern China.